There has been at least one denied Freedom of Info request to get the real numbers, and there is a new one out for which we are waiting to receive the results. The real issue at hand is what are the REAL numbers. 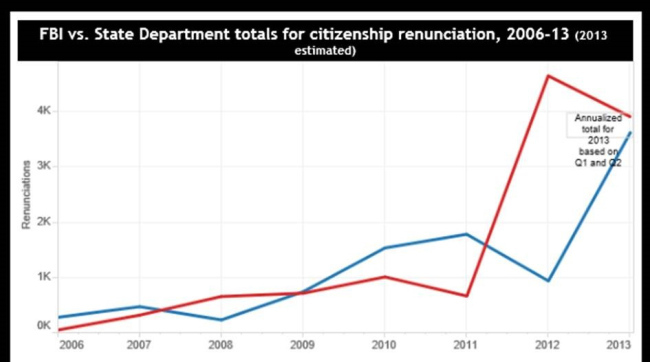 The above graph shows the officially released statistics for renunciations of US citizenship over the period 2006 to 2013. The blue line takes statistics from the Federal Register, the red line is from the FBI list publicized in order to list renunciants who are not allowed to purchase firearms. There are serious deficiencies in the data. This entry was posted in Uncategorized on February 19, 2014 by renounceuscitizenship.